Originating in Mexico, vanilla (scientific name Vanilla planifolia) is one of the very few edible orchid species and a prized and quite expensive spice of great culinary value. Vanilla orchids are climbing vines which flower once and produce a flavored fruit called a pod following pollination. Vanilla pods were used by the Mayans to flavor drinks due to their sweet, delicate flavor. Despite an overall modest nutritional value, vanilla is an important source of antioxidants. Nowadays, this pricey spice is a touch of class on a gourmet dessert, whereas the great majority of us sample a mere synthetic extract meant to give ordinary, day to day desserts an exquisite taste. Vanilla has a relatively poor nutritional profile, containing trace amounts of several essential nutrients, namely riboflavin, niacin, potassium, copper, iron, magnesium and manganese, but compensates for this with an excellent aromatic profile. What is vanilla and where does it come from? Vanilla is a spice obtained from the flavored pods of an edible orchid species of the Vanilla family. Vanilla was first grown in Mexico but it is now being cultivated throughout the tropics in countries such as India, Indonesia, in Central America, Madagascar, Polynesia and so on. Third world countries are preferred for the cultivation of vanilla because of low production costs. Nevertheless, natural disasters have made vanilla costs go as high as 500 dollars per kilogram. There are three subspecies of vanilla, namely Vanilla planifolia, Vanilla pompona and Vanilla tahitensis. Vanilla planifolia is not only the most fragrant, but also the most widely cultivated form. Common names such as flat-leaved vanilla or little pod are derived from the appearance of the fruit. What does vanilla look like? Vanilla is a flowering vine that can reach impressive heights of around 3 meters. Since it is a member of the orchid family, its flowers are beautiful, creamy-white, yellowish orchids. Vanilla flowers are trumpet-shaped and flower for only one day (or several hours). Manual pollination must occur while the flower is open and it results in an incredibly aromatic pod fruit, containing vanilla seeds. When ripe, vanilla pods are dark-brown, almost black in color and split slightly at the ends. When choosing quality vanilla, one must look for pods over 14-15 cm long that show no bruising or blemishes. What is the difference between vanilla pods and vanilla flavor? Basically, vanilla pods are the real thing. They are quite expensive so you will find them mostly in gourmet dishes in fancy restaurants. Pastry and most baked goods, medicine, drinks and skin care products are flavored with synthetic or artificial vanilla, which contains vanillin, one of hundreds of aromatic compounds found in vanilla pods and seeds. However, vanillin is not derived from real vanilla, but from compounds in wood known as lignins. The so-called ‘natural vanilla flavor’ exhibited on food labels contains synthetic vanillin as well as many other artificially-produced compounds meant to mimic vanilla flavor. There isn’t any major difference in taste between vanilla pods and synthetic vanilla flavor, except for the fact that vanilla pods are much more aromatic and fine-tasting. Vanilla extracts are obtained by extracting the flavor from the pods using pure alcohol. However, it is possible to make non-alcoholic vanilla extracts. If you want to make vanilla sugar, put your leftover pods into a jar of sugar and just wait for the flavor to catch on to the sugar. It may take anywhere from a few weeks to up to a month. Similarly, you can flavor sugar or salt with various herbs and spices by placing leaves, flowers or twigs of preferred herbs and spices into a jar of sugar or salt and leaving them for several weeks so that the aromatic essential oils in the seasoning herbs are released. Oils too can be flavored with spices in the same way for extra flavor. 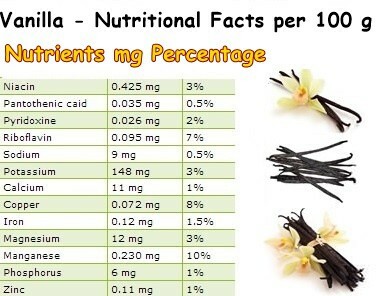 Nutrition facts and health benefits of vanilla pods. 1) Contains almost 200 hundred aromatic compounds. Although some people find vanilla flavor a bit bland, a bit too mild, the pods and seeds are actually rich in aromatic compounds such as vanillin, caproic acid, vanillic acid, eugenol and many other phenolic acids, natural alcohols, lactones and other esters. 2) Vanilla seeds contain good amounts of simple and complex sugars which give a delicate flavor to baked goods and beverages. So instead of purchasing extracts with added sugars, try making your own and enjoy the natural flavor of real vanilla. Although a vanilla extract may have around 288 kcal/100 g of product, it will not affect your weight at all due to the fact that you only use it in trace amounts as flavoring. 3) Good manganese and copper content. If you look at the nutrition table above, you will notice that 100 g of vanilla provides 8% of the RDA of copper and 10% of the RDA of manganese. Copper and manganese are two important minerals which our body uses to detoxify cells by means of an enzyme known as superoxide dismutase. This enzyme uses trace minerals such as copper, iron and manganese to form and prevents cells from being damaged by dangerous oxygen molecules. 4) Contains small amounts of vitamins B2, B3 and B6, potassium, iron and magnesium. Although its nutrition profile is poor when compared to other herbs and spices, it is still heartwarming to know that at least it provides some nutrients, unlike many processed foods and beverages. Also, always remember to buy quality vanilla pods in order to avoid contamination with unhealthy and potentially harmful compounds.